Many delicious locally grown crops can be easily stored for much of the winter—but they are not available in stores all winter long. If you want to eat locally grown potatoes, squash, sweet potatoes, garlic or onions all winter, stock up during the growing season, and find the perfect place in your house or apartment to keep your veggies happy through the winter. Potatoes like cold, damp conditions. A cool basement can keep long-lasting varieties well into March. To protect the potatoes from mice, use recycled 5 gallon buckets or wooden boxes and cover them with screens. If you have a furnace, your basement may be too warm—try the bulkhead. Winter squash, sweet potatoes, garlic, and onions all like cool, dry conditions. 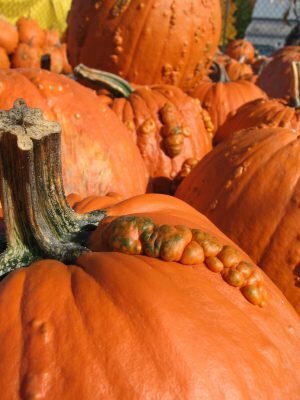 An unheated storage space, like a shed, can be suitable for the early part of the winter — move the squash and pumpkins out when the inside temperature dips below 50°, and the onions and garlic when it threatens to freeze. When it gets colder, an unheated guest bedroom can be a good storage space. Spread the squash out on newspaper and store the garlic, onions, and sweet potatoes in bushel baskets or mesh bags. A cold bedroom closet, an entryway, or any other unheated, cool space will work too. Many root vegetables—carrots, beets, celeriac, for example—also store well in cold (but not freezing) and damp conditions. A bucket of slightly damp sand will provide the moisture they need, and they can also be stored in a cool basement. Other options for keeping these crops cool and crisp include layering them with sawdust or leaves in a bucket or storing them in a cooler in your garage, shed, or on an enclosed porch. Every house varies in terms of where your cool and warm spots are. Try a few places out and keep an eye on your stores to make sure the vegetables aren’t freezing or shrivelling. You can also purchase a thermometer that tracks the high and low temperatures over any given period of time, which can be a good way to make sure your storage spots don’t get too hot or too cold. Root Cellaring, by Mike and Nancy Bubel, is a comprehensive guide to storing vegetables at home. It can teach you how to dig a root cellar in your backyard, or help you store vegetables in a small apartment space.